President Muhammadu Buhari on Sunday said that the fight against corruption is aimed at saving the soul of the nation. 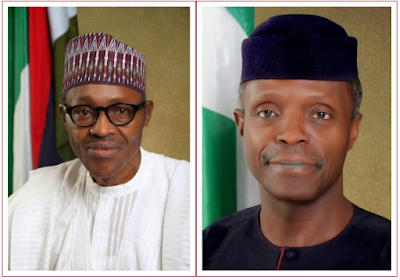 Buhari who was represented by Vice President, Prof. Yemi Osinbajo, made this statement at the second plenary meeting of Catholic Bishops Conference of Nigeria (CBCN), near Port Harcourt. “ Our fight against corruption is not just a battle of virtue and righteousness in our land, but it is a fight for the soul and substance of our nation. “ Corruption in our country is endemic and it constitutes a parallel system,“ he said. According to the President, corruption has made a potentially prosperous country struggle to feed and provide jobs for its people. “ Hundreds of thousands of infants and maternal mortality statistics, hundreds of thousands deaths from communicable diseases are traceable to the greed and corruption of a few,“ he said. Buhari urged Nigerians to think of resuscitating the nation`s economy because two-thirds of Nigerians lived in extreme poverty. “They must be helped, first to survive, and then, fully participate in the economy of the nation. “Consequently, we must create tenets for the very poor and vulnerable, while ensuring that social spending also resurrects investments in the economy. “We must invest substantially in relevant education; teachers training and vocational and entrepreneurial training,“ Buhari said. The President said a way out, was for all Nigerians to invest in infrastructure and all crucial components in the medium and long term means of diversifying the economy. “Meanwhile, we must block all leakages and improve on our revenue base,“ he said. On insurgency, Buhari said Boko Haram had been weakened and lacked the strength to occupy the North-East zone or any part of the country. He also said the military was using local intelligence to thwart efforts of Boko Haram to regroup in the North-East or any part of the country. “On security, we are on course to militarily route Boko Haram and make them incapable of taking over any territory. “Suicide bombings on some parts of the North- East are desperate acts of terrorists to create a sense that they are still in play. “But, with vigilance and local intelligence, we will make these cowardly acts practically impossible,“ he said. Earlier, the President of CBCN, Most Rev. Ignatius Kaigama, said that the new administration in the country would recover the country`s wasted opportunities. “The tendency to promote, defend, and protect narrow personal economic, regional and religious interests have been responsible for our unstable national journey of one step forward and many steps backward,“ he said Kaigama expressed optimism that the new administration would achieve positive change and recover wasted opportunities.